Are we entering a new wagon renaissance? Probably not. But Volvo, Buick and now Jaguar still believe in the longroof, and if the new 2018 Jaguar XF Sportbrake drives half has good as it looks, it should be a winner. 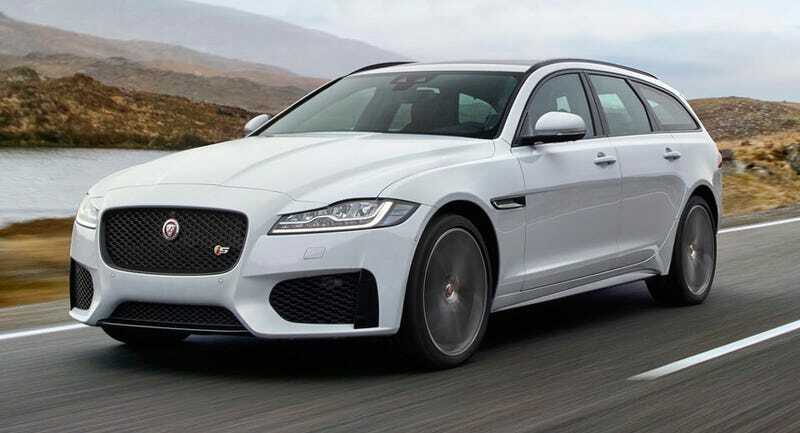 The XF is set to do battle with the all new BMW 5 Series and Mercedes E-class, the former of which won’t be offered in a wagon in the US because BMW would prefer American buy ugly hatchbacks instead. But Jaguar understands that some Americans actually have taste and therefore deserve a stylish car that is both sporty and practical. The automaker will offer a range of gas and diesel four-cylinder motors worldwide, but the American XF S Sportbrake will only be available with Jaguar’s 380 horsepower 3.0-liter supercharged V6. If, for some odd reason, someone prefers the sedan they would have a choice of either four or six-cylinder options. Of course, the new XF will have a slew of advanced technology features that luxury buyers expect in their executive sedan or wagon—such as electronic automatic braking, and semi-automated park assist. It also features some new tech that actually will make the act of driving more enjoyable, such as Intelligent Driveline Dynamics (IDD), which eliminates understeer, allowing the car’s steering to be more agile. That system can also be paired with systems that improve traction in low-grip situations. So what will this lovely Jaguar wagon set you back? The XF S Sportbrake has a starting MSRP of $71,445 including destination. While that is a significant chunk of change, the pricing does fall in line with the Mercedes E400 wagon and besides, can you really put a price on beauty?